In a change to the schedules, it has been decided to make Goodwood's Regional and Club 2DE marathon shorter and easier. This year Goodwood will be using the FEI approved alternative option to Phase A. 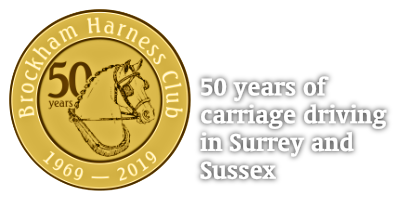 There will be a designated, controlled warm-up area which will be a minimum of 7000 square metres in area, and will be properly stewarded, with a Judge and Vet in attendance. Competitors will be given a time for the Start of A, when they must enter the warm-up area. All the rules and penalties for Marathon Section A will apply to the controlled warm-up area. Competitors must halt during the controlled warm-up if instructed to do so by a steward. The signal will be a double blast on a whistle. Competitors will be called to the compulsory harness/bit check from the controlled warm-up area. They will then proceed to the Transfer Section and then to the Start of B. They will be started on Section B on completion of the Transfer Section without a rest. If you've competed at Goodwood in previous years, you will remember two obstacles among the trees up in the woods. These have been retired for this year, and two new obstacles will be constructed in the fields towards the lorry park. It is hoped that this will allow us to plan a section route with fewer steep climbs. We cannot confirm the length of the section until the course is finalised but it is likely to be between 7 and 8km. It's not too soon to enter Goodwood. There are 4 simultaneous events -- so something for everyone. The 2DE region and club events, and the 1DE Evolution / Young and the world famous Small Pony Grand Prix.